We have dined here 3 or 4 times, and not really because it’s our favorite. We have always been taken out to eat here by family members, which is very kind of them. I must admit, though, that 3 of the 4 times I have dined here, I did get a tummy ache. I can’t figure out why, because my food does seem safe. I had a chicken dish over rice with broccolini. The vegetable was overcooked, which was disappointing, but the rice was seasoned well and the chicken was divine. I was too full for dessert, so I skipped that. Bean had a burger with a second plate of toppings. She had a lot o f fun building her burger. 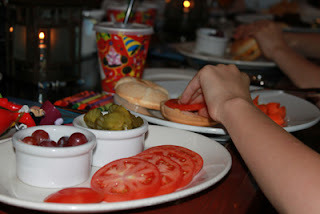 She loves tomatoes and pickles, so this was a good one for her. 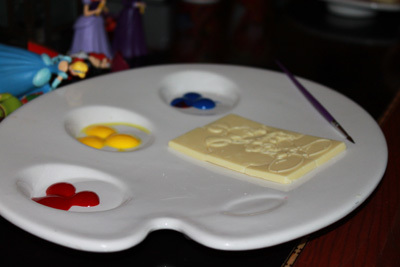 For dessert, the chef brought her the white chocolate Mickey puzzle with edible paints. She adored being able to eat that It was gluten free (may have had dairy, we did not confirm). This normally comes with 2 large cookies, so we had those sent out on a second plate and we gave those to others at the table. This dessert is very fun for the kids, very creative. Bean mixed her paint colors to expand the choices, and then she painted and signed before eating. The SteakHouse at Yacht Club had the same dessert. These are 2 table service credit meals. I thought it was good, but the atmosphere is what makes this worth more, and not the food. The food did not taste better than the food we get at Coral Reef, and that is a 1 table service choice. If you are looking for a quiet place to take a group on short notice, though, this is a nice choice.